On comparison of the number of patients that had nutritional deficiency at 3-month, 6-month and 12-month with the pre-operative values there was no significant increase in the number of patients with nutritional deficiency for either prealbumin(p=0.24,0.6, 1.0), Transferrin, (p=1.0,1.0,1.0), Vit D (p=1.0, 0.6,1.0) or Vit B12(p=1.0,1.0.0.2). Conclusion: Laparoscopic banding as a restrictive bariatric procedure results in a significant loss of the excessive weight of the patients but does not lead to significant nutritional deficiencies. 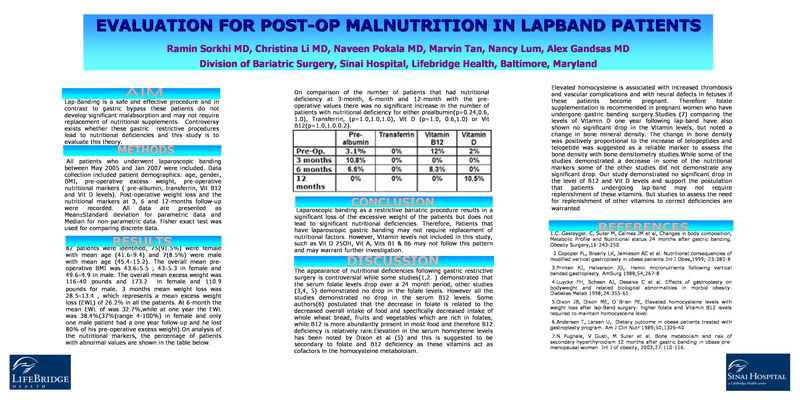 Therefore, Patients that have laparoscopic gastric banding may not require replacement of nutritional factors. However, Vitamin levels not included in this study, such as Vit D 25OH, Vit A, Vits B1 & B6 may not follow this pattern and may warrant further investigation.